We specialize in producing Plastic Bushings, Nylon Bushings, Nylon Sleeve Bushing, Plastic Flanged Bushing, Plastic Flanged Sleeve Bushings, Plastic Insulating Bushing, Plastic Slide Bushings, Plastic Suspension Bushings. Bearings and bushings are used in conjunction, the past bearings and bushings are made of metal, and now the general bearing for the metal, sleeve for plastic. 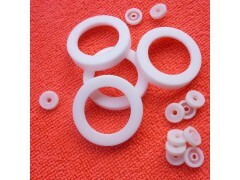 Plastic bushings design and its application, Plastic bushings instead of copper sets in the application of construction machinery has been widely implemented with high mechanical strength, excellent wear resistance, corrosion resistance, anti-aging, no oil self-lubricating, sound absorption shock, non-toxic and so on. High strength plastic sleeve, impact resistance, increased service life, can be customized according to customer requirements.